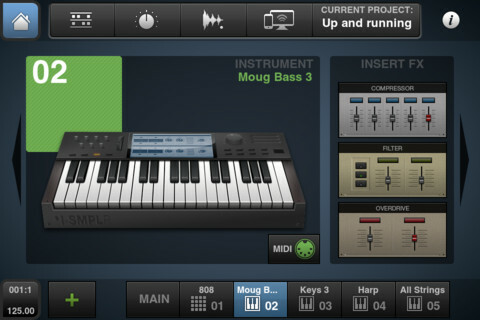 BeatMaker 2 by Intua is a Mobile Audio App. Combining music production tools that were behind the success of countless artists, BeatMaker 2 is a powerful, easy-to-use composition interface for amateurs and professionals alike. Build your own virtual home-studio, create multiple instruments and connect them to a full-range of audio effects. Compose, record, arrange and transform your ideas into complete songs, ready to be shared with others. Import your own sounds or use the sound library provided: more than 170 high-quality instrument and drum presets from synthesizers to realistic orchestral sounds. You can even import songs from your iPod library. Connect your MIDI accessories for an external control of BeatMaker's instruments, effects and mixer, ideal for home-studio productions and live performances. Using MIDI outputs and virtual ports, BeatMaker can now control your hardware instruments and compatible iOS music applications within BeatMaker, unleashing whole new sonic possibilities by connecting to other synthesizers and sequencers. 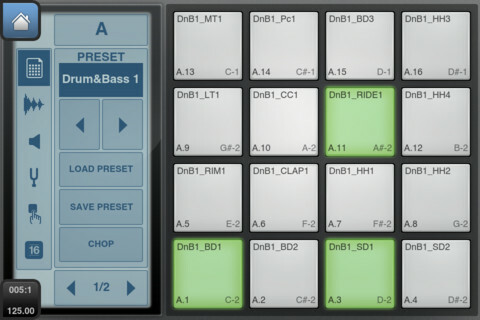 Create multiple instruments with Drum Machine or Keyboard interface. 10 effect units to choose from: Reverb, Compressor, Filter, Delay, EQ, Flanger, Chorus, AutoPan, BitCrusher, Overdrive. 3 effect slots for each instrument, unlimited global effect racks. Customizable Cross Controller for all effects, to manipulate multiple parameters at once. MIDI inputs, outputs, virtual ports and sync support: connect your MIDI accessories and compatible iOS applications to control BeatMaker's instruments, effects, mixer... and vice-versa. 128-key keyboard with pitch wheel, double keyboard mode, note display and zoom controls. Easily create your own instruments from any sample combination with the keygroup editor. Volume and filter ADSR envelopes. Low/high pass filter with cutoff, resonance and key tracking. 2 LFOs with customizable amplitude, offset and rate (synchronizable), controlling volume, pitch and filter parameters. Polyphony control, with up to 32 voices per keyboard sampler. Legato play mode with customizable glide. Keygroup controls: volume, pan, semitones, fine-tune, reverse and one-shot, hold, hold & loop trigger modes. Full-fledged wave editor with intuitive pinch and selection for manipulating samples. Chop Lab: easily slice your samples and automatically create presets and patterns out of them. Basic edition tools: trim, cut, copy, paste, with 8 levels undo/redo. High quality time-stretching and pitch-shifting algorithms. Audio tools: normalize, silence, reverse, fade in and out, cross-fade. Record new samples from device microphone or plugged instrument. Loop points and tempo/signature editor. 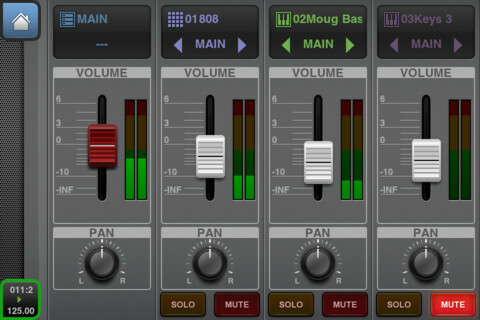 Realistic multi-track mixer with level meters. Edit volume, pan, solo, mute and bus routing features for individual tracks. 68 Drum Machine presets from all genres. 111 Keyboard Sampler presets, from synthesizers to realistic orchestral instruments. More than 1800 quality samples to choose from. Up to 128 trigger pads: 16 pads over 8 different banks. Chop Lab: Slice audio loops to automatically create new sound presets and patterns. Control sound parameters on individual pad: volume, pan, mute, output bus, semitone, fine tune, reverse and autoscaling. Edit samples start and end playback positions. Low/high pass filter per pad with cutoff and resonance control. Choose between various pad trigger modes: one-shot, hold & loop. Customizable envelope (ADSR) control for each pad. Exclusive groups and polyphony management. "Live" modes: trigger, mute, reverse, velocity and tune spreading. Create unlimited instrument and FX tracks. 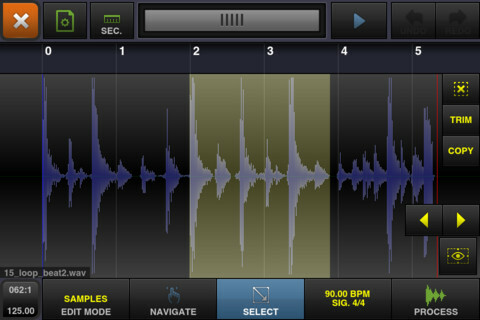 Automations: Record, edit and replay instrument and effect parameters. 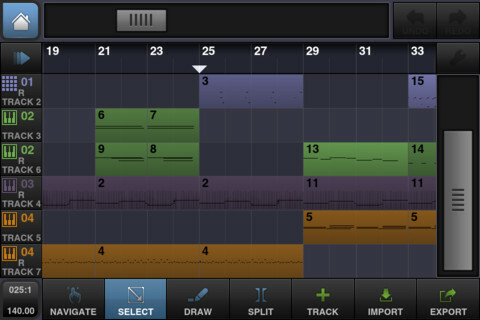 Record, draw, arrange and resize patterns along the timeline to build your song. Compose and modify patterns with a piano-roll interface. Edit notes, parameters, and automations. Includes multiple convenient tools such as zooming. Native iPad and iPhone interfaces. Export your songs to Audio or MIDI files. MIDI Out, Sync, Thru support. Virtual MIDI support: connect multiple music iOS apps together. Transfer and manage your files from your computer using the integrated FTP server. Import any songs from your iPod library to create new remixes. Share audio content with more than 20 other music applications using the iOS pasteboard. Upload your songs directly to your SoundCloud account. Access, download, upload to and manage your DropBox account. User friendly file browser and manager, with sample, preset and project tagging for quick lookup. Supports BeatMaker 1 kits and projects. Works with A2DP-compliant Bluetooth speakers and headphones (output only).